At this writing, Casio's Green Slim portable projectors with their unique LED/Laser Hybrid light source are the most popular models on ProjectorCentral in the portable/mobile presentation category. Their popularity is easy to understand. They are thin enough to slip easily into a briefcase, and the reputed 20,000-hour life of the light source means there is no cost of replacement lamps down the road. These are the first truly bright projectors that do not operate on high pressure lamps. We have now tested five samples in the Green Slim line, including four XJ-A130s and one XJ-A145. As previously reported here, four of the five fell short of the official lumen specification by at least 40%. On the other hand, one sample, an A130 rated at 2000 lumens, measured 1630 lumens in its brightest mode, and was obviously brighter than the others. Meanwhile, we have two trusted outside sources who both claim that their test samples are measuring much closer to spec than ours have. 1. Early production flaws. Casio management states that "some of the initial Green Slim production units may not achieve their specified brightness" due to a "slight misalignment of the mirrors in the light path." Casio claims that they have taken corrective action to ensure proper mirror and lens placement during production. We do not know when this corrective action was taken or what serial numbers are involved. However, it appears that mirror misalignments help to explain why some units are measuring much closer to spec than others. 2. Variables in measurement procedures. Variances in lumen readings can also come from differences in test procedures. 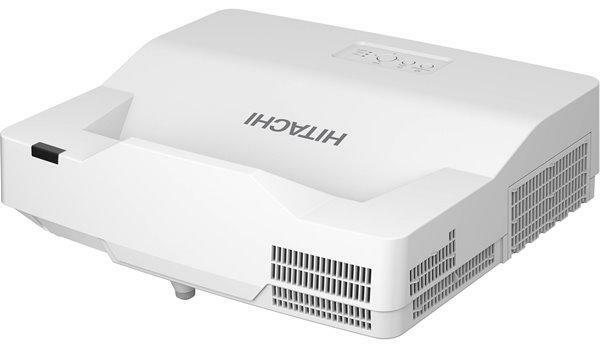 For example, conventional projectors with high pressure lamps tend to show an incremental increase in brightness as they warm up to stabilized operating temperature. Accordingly, we normally allow a test sample to run for ten to fifteen minutes to warm up and stabilize before taking a lumen reading. Oddly enough, the solid state light sources used in the Casio Hybrid engine do not get brighter as they warm up. To the contrary, they diminish in brightness by about 10% as they warm up to their stabilized operating temperature. Thus, the brightest possible lumen readings on these units are obtained during the first minute of operation, immediately after powering them on. Casio states that they measure brightness within the first minute of operation to determine whether the unit is meeting spec. Due to this difference in procedure, our readings will always be lower since we wait until the light output has stabilized. 3. Ambient temperature. In addition to these factors, Casio informed us last week that the ambient temperature in the room will affect lumen output. We have never encountered this before. All of our lumen readings are done in a test area that averages 72 to 74 degrees Fahrenheit, or what most people would consider to be typical room temperature. Casio points out that the ISO 21118 protocol for lumen measurements calls for an ambient temperature in the test facility of 64.4 degrees F, or 18 degrees Celsius. In order to see whether ambient temperature does indeed affect lumen readings on the Green Slim models, we cooled our test area down to 64.4 degrees F. To our surprise, we did see an increase in brightness of 5%. Our test sample that initially measured 1630 lumens is no longer that bright since it has been subjected to extended usage testing. It now has 200 hours of runtime on it, and its lumen output has degraded accordingly (more on this below). But had we measured that unit in a 64.4 degree ambient temperature when it was fresh out of the box, and had we measured it during its first minute of operation, our lumen reading would have exceeded 1900, or very close to the 2000 lumen spec. Since the LED and laser are solid state light sources, can the user expect that this light engine will maintain its light output over its 20,000-hour anticipated life? Of course we cannot run them that long, but we did want to perform some initial life testing to see if we could detect any change in brightness over time. Therefore, we subjected two of our A130 samples to extended runtimes, turning them on and allowing them to run 24/7 until they accumulated 200 hours. The result is that both units lost about 25% of their maximum light potential during the 200 hour test. The unit that initially read 1630 lumens now measures 1216 lumens under the same test conditions. The unit that originally produced 1228 lumens now generates 949 maximum. Two notes must be added here. First, 24/7 operation is not the normal duty cycle for a mobile presentation projector. We do not know whether this light engine would degrade to the same degree if the units were operated in a more typical fashion, running them in increments of an hour or two, then shutting them down. Second, our testing is done in Las Vegas at an elevation of 3100 feet. It is possible that the slightly thinner atmosphere would hasten the degradation of the engine compared to operation at sea level. However, we did operate one of the two units with the high altitude fan engaged during the entire 200 hour run, and we found no significant difference in percentage of lumen degradation between the two samples. The lumen degradation in the extended use test was due to a diminishing of the intensity of green and blue, the two colors produced by the laser source. Red, which comes from an LED, stayed comparatively stable. As a result, color temperature will shift over the course of time as the relative strength of red, green, and blue change. We also noticed that the power consumption on the brighter of the two units diminished in direct correlation with light output. The unit that originally measured 1630 lumens was drawing 177 watts at that brightness level. At the end of the test it was delivering only 1216 lumens, but power consumption had dropped to 134 watts, a drop of 25%. The Casio LED/Laser Hybrid engine is a fascinating new development in the industry. It is as novel as anything we've seen in the projector business. Casio designers certainly earn high accolades for creativity and originality. Yet as with anything new and untested, there are many questions left unanswered. How far will lumen output fall over time before it stabilizes? Will color temperature be acceptable once it does? How will the duty cycle, or type of usage, affect lumen degradation? Despite the theoretical 20,000-hour life, would the user want to replace the laser module much sooner than that to restore the projector's initial brightness? All of these things will be interesting to watch. And clearly a lot of people are watching. At this writing, the Top Ten rankings (popularity rankings) in the Portable category, in both XGA and WXGA resolutions, are dominated by Casio Green Slim models. About five years ago LEDs started to appear in automobile turn signals and taillights. Two years ago Lexus introduced LEDs foe low beam headlights. This year Cadillac now has high beam LEDs. The Casio machine with LEDs for red is sort of like LEDs for low beam headlights. That is to say it's just a temporary work around until the technology gets better. Similarly Ferdinand Porsche wanted a an electrical automobile but the batteries of 1905 weren't up to it - so he invented the hybrid. Batteries still aren't powerful enough more that a century later so we still have automotive hybrids. My guess is that LEDs will mature faster than batteries and no one will want a hybrid light source projector next year. None of the Casio's bizarre problems that you so well documented and explained have been seen in non-hybrid projectors. I expect that in just a few months the Casio will become a exhibit for technology museums - in the fascinating kludge area. Laser sources produce speckle. If you display a solid green or blue flat image, then slowly move your head sideways about an inch. The speckle will look like a grainy screen with the grain structure rapidly moving across the image as you shift your eyepoint. How noticable is the speckle? All laser based displays should be evaluated for speckle. Most end-users do not notice speckle, and most end-users would not be able to tell you if a 2000 lumen projector is producing 2000 lumens or not (neither would a lot of people in the industry!). The bottom line is that Casio has developed a unique product that will suit most travelling presenters very, very well... and like it or not- I think it will be some time before these are sub-planted by a "better" technology as none of the manufacturer's I have talked to have an answer for this projector right now. Casio, for the foreseeable future, has a one-of-a-kind on their hands... and if you are a presenter that needs to hit the streets and airports to make a living- this series of projectors is a great tool to help you reach your goal. I have an XJ-A250. It replaced a 3200 Lumen Panasonic and in spite of some of it's limitations, I love this projector. I'm a sales trainer and keynote speaker and work in both large and small venues. First of all, this is the easiest projector I've ever used when it comes to set up. Just turn it on and in seconds you've got a full bright image and the keystone and focus kick in to adjust the picture perfectly. The zoom feature really allows you to project a huge image from a short distance, so in my opinion this is much better than going for a "short throw" unit because it give you tremendous flexibility - you can operate from pretty much any distance. I've read all the reviews and I know there has been much discussion about the Casio not meeting it's stated lumen output, but all I can say (since I don't have the ability to measure) is that I got a beautiful bright picture in a fully lit conference room. And here's what I loved the most, the Light Source doesn't produce a ton of heat. The fan does cool the unit but on conventional projectors (both DLP and LCD) with regular high pressure bulbs, they are just plain hot. When working in a small room full of people, I find myself constantly losing the battle to control room temp because all my previous projectors were kicking out so much heat. Not with this baby .... it stays cool to the touch and the fan output is like a gentle warm (not hot) breeze, which means I can keep a comfortable environment for all us, including me when I'm dancing around the front of the room doing my thing. With ease of setup, crisp bright images, and cool operation, this thin light projector is this road warriors new best friend. With lamp-based projectors we found that too many 'users' would not let them cool properly and we'd end up replacing a lot of expensive lamps. These are a bit more rugged, on average smaller, and perform very favorably even in office-ambient light. For our travelers these models have fit the niche perfectly. Are they perfect? No, and I'll be looking forward to next-gen evolution of solid-state light sources. But meanwhile they fill the traveling niche better than the others!